Can you believe it? Nadine Lustre inspired Marvel's first official look for Wave! Over the past couple of weeks, everyone's been guessing who will portray Wave, the first-ever Pinay superhero in the Marvel Cinematic Universe, on the big screen. From Miss Universe 2015 Pia Wurtzbach to The General's Daughter star Angel Locsin, fans could only hope for the actress who will play Wave to be someone who could give justice to the character. And now, Nadine Lustre just got added to the list. On Facebook, Comic Odyssey confirmed that they are now officially taking pre-orders for War of Realms: New Agents of Atlas with Mico Suayan and Rain Beredo illustrating the variant cover of Marvel's Wave. 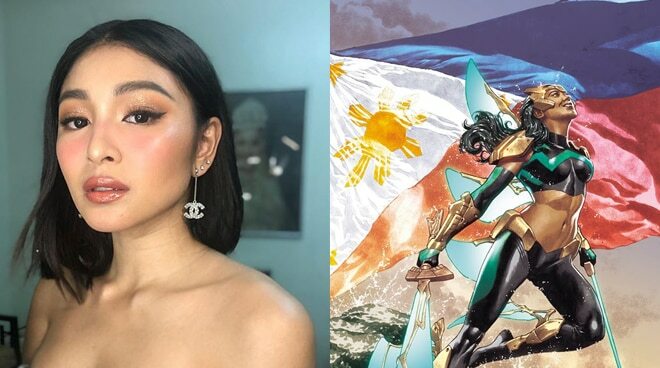 Suayan, on his personal Facebook account, revealed that Nadine Lustre was the one who inspired his illustration for the debut comic cover of the Pinay superhero. "A little trivia. I based my rendition of Wave to Nadine Lustre," Suayan wrote.